from the internet this weekend. After the stress of last week, I just needed some time to gather myself and have a weekend of hard labor to work things through. *wink* Wade and I have been working on the house again this weekend. We are *this close* to being done. The baseboards are in. They need to be caulked and touched up with paint, but they are in. Eleven days. We have eleven days before out of town company comes in…we’ll have it done. So…Friday, I spent some quality time with my friends Emily and Ronda in a local quilting store. Gah! I really didn’t need to know that there was a specialty fabric store that close to me. Could be seriously dangerous… I decided that I need a new bag for my new back to school adventure. (oooh! Tomorrow is pre-registration…more on that later!) 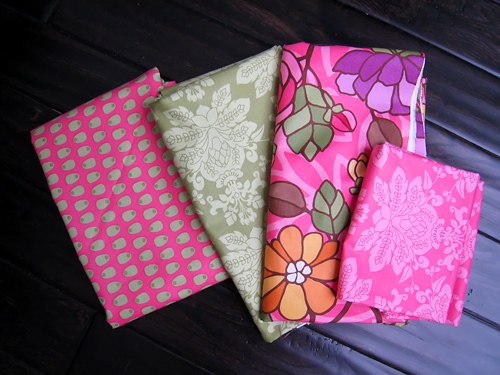 Ronda loaned me a totally cute Amy Butler pattern and I got some awesome fabric. 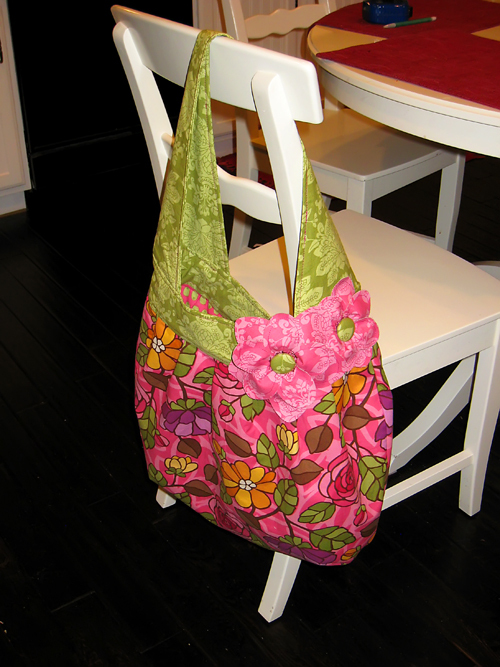 Originally, the pink “olive” fabric was supposed to be the handle and the green was the inside, but more than halfway of cutting the green fabric I realized that I got it mixed up. It was totally a happy accident. It came out much better the other way around. Must have been my crafty subconscious. The inside, I ended up doing some machine quilting. The first time I’ve done quilting more than a simple X on a square. I love how it turned out! By Sunday afternoon…I was totally finished! 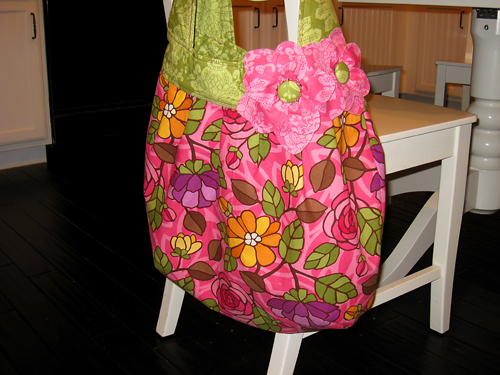 Tomorrow, I am going to carry my new bag and get pre-registered for the first five classes in my new venture. I could not be happier!! hey you clueless communis, how did scrapping morph into quilting?? fantastic bag 🙂 I admire you. you make everything look effortless. ps whoever holly is, I think she wants a red and black bag. I like plum and charcoal grey. here’s the “t” that fell out of my comment —> t.
Well….Momma’s gotta brand new bag! Yeah, I know the song is “Poppa’s gotta brand new bag.” IT’S A GOOD THING! “Red & Black”, Hmmmmm…I think I know who “Holly” is. I love you both & you too “Ducky”. This is totally adorable. I love the green as the handles. And that flower is so awesome!!!! 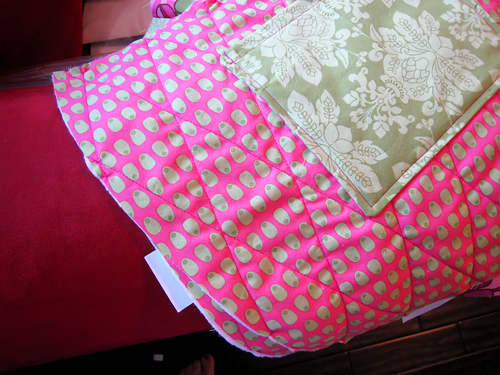 ohh and the quilting is a fabulous idea! I want one, I want one!!!!!!!!!!!!!!!! Purple & green?? heather! this is awesome, i â™¥ your bag, absolutely lovely. i don’t feel as bad now, i’ve been cheating on my other crafts and fabric has taken over my life these days, i love sewing more and more now. tomorrow i take a class to do the ‘ruthie clutch’ a design by anna maria horner: http://store.annamariahorner.com/ruthieclutch.html – nervous but excited too! I would just like to say that I think it is time for an update! I would like to see some new pictures of my nephews (and you and Wade too!) Love you guys and miss you and I will let you know as soon as I hear something.